Last Updated: December 11, 2018 | Subscribe to our weekly newsletter! In the middle of an unbearably hot summer, the idea of diving into a cool, clear pool is more than inviting. But no one wants to jump into too-cold water, either. That’s the kind of shock to the system we can do without. Or maybe your kids accidentally turned the pool heater up to the maximum, and you’re dealing with a hot spring in your back yard. Unless you’re going to start charging admission, you’ll probably want to cool that down. Either way, a pool thermometer is going to tell you exactly what you’re dealing with, and whether you need to do anything about it. OK, we don’t need to explain what a pool thermometer does. But you might be wondering why it’s necessary. Knowing the exact temperature of your pool offers a couple of benefits other than simply avoiding a cold shock when you jump in. If you’re taking the trouble and spending the money to heat your pool, you want to know that everything is working properly. If your pool heater isn’t doing its job, you can tell because the pool feels colder than it should be. But knowing just how far the temperature has fallen can tell you whether the heater just need to be turned up, or there’s something wrong that requires repairing, or even replacing the heater. If you live in a warm climate, a pool heater is great for fall and winter, but may not be as needed in the height of summer. Keeping an eye on your water temperature can allow you to turn the heater down—or possibly even off—to save energy and money, and do something good for the environment. Some people who use your pool may have specific temperature needs. For example, heat can make multiple sclerosis symptoms worse. Keeping pool water at a comfortable temperature can help someone with that condition not only enjoy the pool, but feel some relief from their condition. It can also help them get the exercise they need without overheating their body. And if you have young children or any elderly pool guests, they’ll be less able to tolerate colder water, so it’s important to keep the temperature at levels that won’t harm them. A pool thermometer is the only way you’re going to be sure the water is warm or cool enough for those who use your pool. They’re relatively simple tools, but pool thermometers have more features than you may be aware of. They fall into one or more of four basic categories: mercury, digital, floating, and handheld. A thermometer can be either digital or mercury, and be of the floating variety, but handheld thermometers will, of course, always be digital. Mercury-filled floating thermometers can be damaged by severe weather and overzealous swimmers. If they break, you could have a real mess on your hands, including mercury in the water. Not to mention, broken glass could rip your liner, or worse, hurt a swimmer. For these reasons, we highly recommend using a plastic, digital, or handheld pool thermometer. You’ll find a lot of pool thermometers on the market, and you wouldn’t think there’d be much variance in quality. But the truth is, some do work better than others. Read up on some of the betters ones available to make sure you’re not wasting your money. Inexpensive and functional. This Milliard pool thermometer If you click this link and make a purchase, we earn a commission at no additional cost to you. is a basic model that measures from -4°F to 158°F (-20°C to 70°C). It has an easy-to-read, 3-inch display, and a 3-minute auto-off feature to preserve the 1.5V LR44 button battery If you click this link and make a purchase, we earn a commission at no additional cost to you. it uses. It still measures the temperature while it’s off, though, to give you an instant readout at any time. It’s built to remain afloat on the surface, but you can also attach it to your pool wall with the included 42-inch nylon cord. It’s ideal for pools, but you can also use it in your hot tub, if you have one. 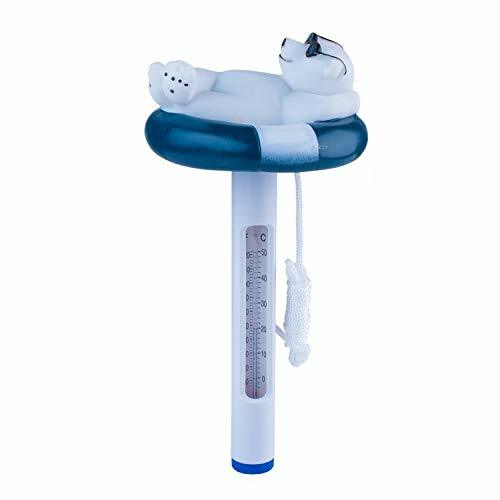 Why have a plain, boring thermometer floating around your pool when you could have a cute polar bear If you click this link and make a purchase, we earn a commission at no additional cost to you. ?! He measures both Fahrenheit and Celsius, and includes a rope tether if you’d rather keep him in one place. He does use mercury to measure the temperature, but he’s made from ABS plastic (Acrylonitrile butadiene styrene—say that three times fast), a durable thermoplastic polymer. This means there’s little chance of him breaking with normal use, and spilling that mercury into your pool. By the way, Milliard also makes a turtle If you click this link and make a purchase, we earn a commission at no additional cost to you. and a rubber duckie If you click this link and make a purchase, we earn a commission at no additional cost to you. pool thermometer, if you prefer. Or order all three, and let them have a little pool party! Now we’re gettin’ a little fancy. Sure, you could read the water temperature by looking directly at the pool thermometer. But why walk all the way outside to do that when you could just read it on the display console you keep inside? This thermometer uses wireless technology If you click this link and make a purchase, we earn a commission at no additional cost to you. to transmit via line of sight over about 100 feet, and shows the temperature on an LCD display. Its 8-channel selectable switch allows you to monitor temperatures from up to eight different locations with additional sensors. It’s solar-powered, but uses 4 AAA batteries for backup, and updates about every 60 seconds. Important: Make sure to remove your floating pool thermometer when adding chemicals to the pool. Until they’ve dissipated, some pool chemicals can be harsh on plastic thermometers, and may cause some corrosion. Did we say fancy? Now we’re talking futuristic. 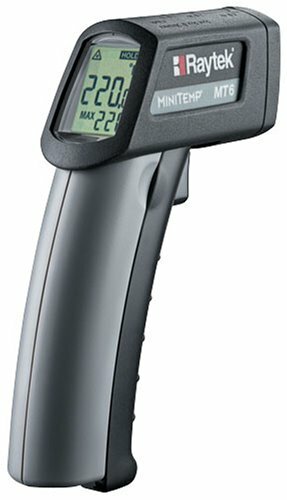 The Raytek infrared pool thermometer measures from -20ºF to 932ºF (-30ºC to 500ºC), and provides instant readings If you click this link and make a purchase, we earn a commission at no additional cost to you. on a large, easy-to-read, backlit display. Yes, instant—the response time is less than 500 milliseconds. It’s durable and compact, has an ergonomic design, and uses a 9V alkaline battery, which is included. This one also comes with a protective boot and a storage pouch to help it avoid damage and last a long time. OK, we admit. This one may be a little overkill. But if you’re a gadget geek, you’re gonna love it. 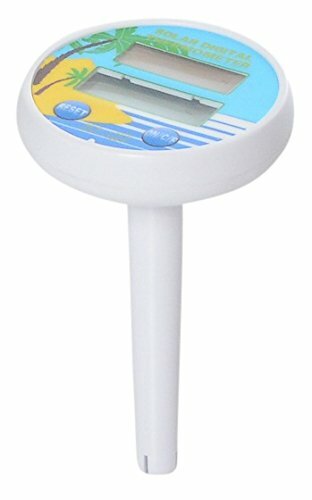 Keep this handheld laser pool thermometer If you click this link and make a purchase, we earn a commission at no additional cost to you. 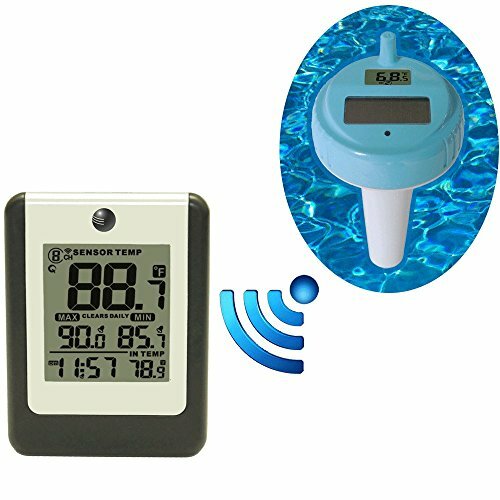 by your lounge chair, and instantly get a temperature reading on any part of the pool. Because your water temperature will vary according to depth, aiming it at the middle of the pool is ideal. 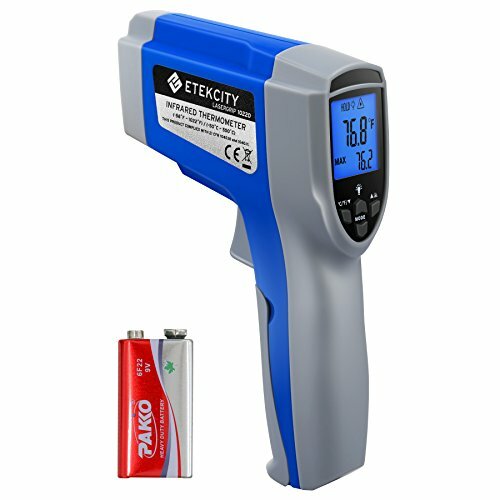 The Etekcity uses a pre-installed 9V battery, and measures temperatures from -58°F to 1022°F (-50°C to 550°C). OK, so your pool is never going to be 1022°F (at least, we hope not!). But this device can also come in handy when you’re barbequing, doing car maintenance, or home repairs, so you can really get your money’s worth. Not only that, it comes with a 2-year warranty, and lifetime customer support. Why risk jumping into a freezing cold pool when you can know what you’re getting into beforehand? 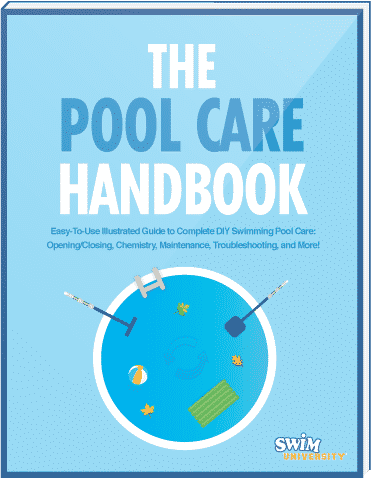 Grab a reliable pool thermometer, and gain control over one more part of your pool maintenance.